Everyone has heard the tales of St. Bernards being used by monks to help rescue lost travelers trapped in the Swiss Alps by carrying barrels filled with alcoholic beverages on their collars. Well, the dogs were actually used, but the barrels were only a legend... until now. 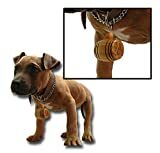 These cool new St. Bernard Barrel Collars are the ultimate in cool St. Bernard bling! These legendary and fully-functioning mini kegs are made from authentic handcrafted American White Oak aging barrels with metal bands in the style of your choice. They can actually be filled with whisk(e)y, brandy, wine, or your favorite poison and they even feature working spigots to keep the spirits flowing. These fun barrel collars are perfect for dressing up your pooch during holidays, for stockpiling rejuvenating booze during severe winter weather walks, or just for carrying water for your dog during long summer strolls.